In the late 1930’s Father Smyth commissioned Henry V. Murphy, then a parishioner, to design the new convent, rectory, and church. The convent and rectory were completed during the pastorate (1940-52) of Father Owen Smith. Upon the arrival of Father Leo Kelly, as pastor in 1952, plans for the new church were revised, allowing for increased construction costs in the post war boom, and work begun on the building dedicated on the Feast of Christ the King, 1954. Long associated with projects for the Diocese of Brooklyn and Queens, Murphy maintained an office in the old Williamsburgh Savings Bank. He was active from the 1930’s until the 1950’s, dying in 1960. 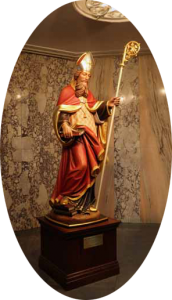 In addition to St. Anselm’s, he is known to have designed St. Athanasius, Our Lady of Refuge, Holy Family, and St. Bernadette, all in Brooklyn, and Holy Child Jesus, Immaculate Conception, and St. Andrew Avellino, all in Queens. He also designed the Catholic Seamen’s Institute, now demolished. All of Murphy’s churches share a number of traits. They are usually constructed of brick with limestone trim, with decorations focused on the entrances and top of the bell towers, and the towers set back from the front façade. All of theses traits are evident here at St. Anselm’s. In terms of style, he shows a preference for “Romanesque” which is also the case with St. Anselm’s, as it was described in the 1954 dedication journal for the church. The Romanesque style, which flourished in the 11th and 12th centuries, typically uses round arches, and the name actually derives from the Romans, who invented the rounded arch. The round rose windows, the rounded arches of the windows on the façade and in the sanctuary area, the monumental round arches of the sanctuary and shrine areas, as well as the segmented arches of the interior ceiling trusses all signify Romanesque in Saint Anselm’s. While frequently employing motifs from different historical styles, Murphy often made use of contemporary Art Deco flourishes, a style, which was popular in the United States between the two World Wars and can be seen in many New York City Buildings (Rockefeller Center, the Chrysler Building, and the Empire State Building). Elements of Art Deco at Saint Anselm’s are the highly stylized and flattened sculptures on the façade and bell tower, the geometric shapes of the bell tower, and the stylized lettering on the façade and the inscription running along the interior walls below the trusses of the ceiling. Inside the church, the focus is clearly on the high altar, with the side altars of Our Lady and Saint Joseph smaller in size and thus visually less important. Murphy’s churches tend to have small sanctuaries in relationship to the “nave” (the main space where the worshipers sit). Sight lines are very important, and there is never a pew where the view of the altar is obscured. The design of the nave space is very clean and simple. There are no decorative piers on the walls, and the absence of columns within the space provides an uninterrupted view of the altar from every pew (as opposed to St. Patrick’s Cathedral for example). The sidewalls wrap the nave and are emphasized with pink marble wainscot. There are no moldings around the doors or windows. The coffered ceiling of the nave, visually “supported” by segmented arches and “corbels”, is purely decorative, the entire roof being supported by hidden steel beams.